Alright, so it's not very Christmas-y, but because I know so many of you want it I'm sharing the link for the Mermaid Name Generator. You'll find it HERE. Zarina Nymphana (!) I am a Mediterranean mermaid. You can choose to be an Arctic, Pacific, Tropical or Mediterranean mermaid (or merman). "Merperson" it seems.... have fun! 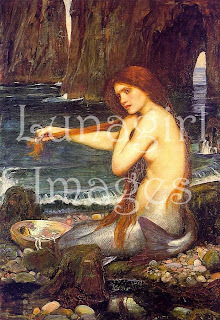 And are you looking for some lovely vintage mermaid artwork and images to express your mermaid soul?